With ever-growing volumes of data and backup bottlenecks created by virtualized server environments, many IT organizations are faced with an imperative to redesign their backup infrastructure to one that is disk- and network-based, rather than continuing to pour money and resources into legacy tape-based systems. EMC is the leading provider of disk-based backup and recovery solutions, and also leads the industry in deduplication storage and software. 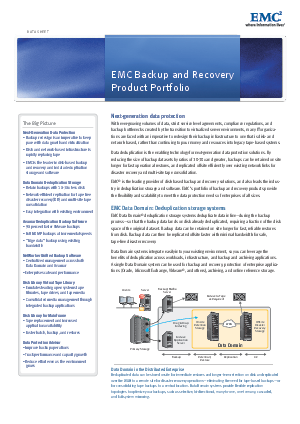 This document showcases EMC’s portfolio of backup and recovery products and describes how they provide the flexiblity and scalability to meet the data protection needs of enterprises of all sizes.